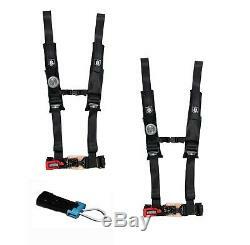 4 Point Harness with 2 Pads Black & Bypass Plug Polaris RZR XP900 XC / XP1000 / XP1000 4. Pro Armor now offers 4 Point Harnesses. The belts also come with a Free LED Flashlight (mesh pocket for light with velcro closure) & adjustable sternum strap. These harnesses are also easy in and easy out due to the fact the shoulder harnesses are sewn to the lap belts so less hardware & hassle for the latch and link system. Sewn together harnesses have passed all SFI testing but are not SFI certified for racing. Pro Armor Harness Connector Bypass Plug. Designed for use on RZR1000 and RZR900 (all models). Allows install of harnesses without putting the RZR in limp mode. No wiring required, simple plug & play install. We are an authorized Pro Armor dealer. The item "Pro Armor 4 Point Harness 2 Pads Seat Belt PAIR BYPASS BLACK RZR XP900 XP1000" is in sale since Thursday, September 24, 2015. This item is in the category "eBay Motors\Parts & Accessories\ATV, Side-by-Side & UTV Parts & Accessories\Body & Frame\Seats".